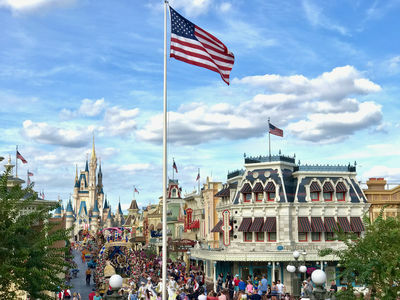 As I'm sitting here writing this article, I'm beside myself excited because the official countdown has finally hit the single digit mark for our summer vacation to Walt Disney World. Soon 23 of us will be headed down to the most magical place on Earth for eight days of full blown fun and frivolity. What is it, you may ask, that could bring 23 people together to spend a week at Disney in the middle of the summer heat and tourist season? The opening of Toy Story Land? A chance to finally get on Avatar: Flight of Passage at Animal Kingdom while hopefully everybody else is at Toy Story Land? A Starbucks finally open in each of the four Walt Disney World parks? That dance party with Edna Mode of The Incredibles in Tomorrowland? Those are all exciting possibilities for sure, but it's simpler than that. Someone in the group is turning 50 and the only thing that immediately entered that person's mind when he thought about hitting this milestone was, with all apologies to the NFL, "I'm going to Disney World!" And who is this grown man that wants to get in touch with his inner child for a week? Well, it's me of course. No surprise there. Although, people still ask me, "Are you really going back to Disney for your 50th birthday?" Is it that crazy of a notion? Obviously, I think not. What better place is there to celebrate the passing of the first half century of my life? What better place is there to feel young again as I leave my forties behind and turn the big 5-Oh. Truth be told, I'm not dreading 50 at all. It's just another day. Granted it's going to be just another day spent eating breakfast with Winnie the Pooh and his pals, smiling like a little kid on Peter Pan's Flight, blasting off to outer space on Space Mountain, defeating Zurg in Buzz Lightyear's Space Ranger Spin and getting choked up during the Happily Ever After fireworks. Maybe I'll even get to be "That Guy" in The Laugh Floor. The possibilities are endless. So, I ask again. Could there be a better way to spend your 50th birthday? For years I've been saying, "I'm turning 50 at Disney, there's not much room for discussion." My wife and kids knew there was really no other choice for me. We do go other places. My parents have a home by the beach and my in-laws have a place on a lake. We ski. We spent a wonderful few days lying on a beach in Turks and Caicos last summer. Those places are all fine and dandy but, for this particular occasion, I need the magic of Disney. I was there as a school chaperone in March, so it's not like I've been away from Walt Disney World for very long. But that trip wasn't about me and my loved ones sharing the magic together. It was a great time, but this is going to be different. It's going to be personal. My kids. My wife. My parents. My brother. Close family members and friends gathering together to help me stay young on my 50th in one of my favorite places on the planet? I'm all in. Planning a trip for 23 people was no picnic at times. Some of the travelers are Disney experts and we've been there many times together. Some have been there once, maybe twice years ago. Still others are total newbies. It's a wonderful mix and it's hard to believe it all fell together and it's all actually about to happen. I'm the one in this crowd with the Disney PhD so I, happily, planned just about all of it. It took a lot of time on the phone and in front of the laptop to make it all happen, but here it is and it's happening. So what is my 50th going to be like at Walt Disney World? Maybe you have a milestone of your own coming up and you're looking for some ideas. Let's take a look at what I'm going to do with my Top 5 ways I'm planning on turning 50 at Walt Disney World. The notion of going deluxe wasn't really up for discussion. I don't want to sound snobby, because I'm not. I'm a big fan of Port Orleans Riverside and French Quarter. I've had several great trips at Caribbean Beach. I even enjoyed the All Stars as a chaperone back in March. However, if I'm celebrating a biggie, then I'm going all out. Plus, we've been lucky enough to have gotten a Disney postcard or email every year for a long time now offering us a nice discount to come back. It's typically 30% off for a Deluxe resort, so it was pretty much a no-brainer. We've stayed at The Yacht Club several times and it's really become our favorite. 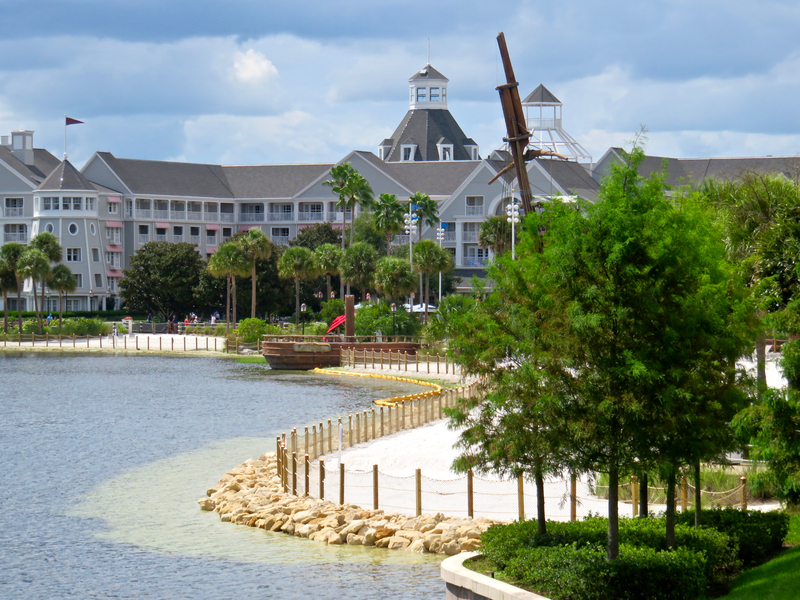 Just a partial view of Disney's Yacht Club. Photo by Alan S. Dalinka. We adore the Polynesian, but even with the discount code, it was too expensive. We're a family of five so the rooms at Wilderness Lodge and Animal Kingdom Lodge are out. I love visiting the Contemporary and the BoardWalk, but if I'm going to stay someplace special, for me it's The Yacht Club. It's classy, but not stuffy. It's a little more peaceful than The Beach Club next door. Stormalong Bay is the greatest pool of any hotel I've ever stayed in and you can walk right into Epcot, so what's not to love? 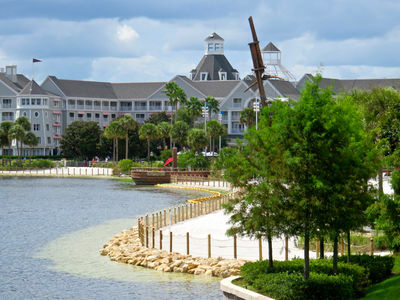 In the interest of fairness to my crowd of travelers, I offered to find them rooms at less costly Disney resorts but they all opted to splurge along with me. Disney also offered a pretty good deal to the general public as well, so it should be quite a good time over at The Yacht Club with all 23 of us staying there. We've always been a park hopping family. Park Hoppers offer you the freedom to head wherever you want whenever you want. This is especially true when you're staying at a place like The Yacht Club. We'll typically get to a park early on in the morning, then head back during the midday heat to swim. Later on, we'll typically walk into World Showcase for some dinner and then we could theoretically head over to Magic Kingdom on the monorail or take the boat to the Studios. Park Hoppers make that happen. On my 50th though, I'm going to try and break with our usual traditions and spend as much time as possible in one park—Magic Kingdom. I'm ready for a full day at the Magic Kingdom. Photo by Alan S. Dalinka. It's open from 9 a.m. to 10 p.m. that day, so we could get there around 8 and walk down Main Street to the castle, spend the whole day there, and then spend almost an hour past closing until they practically kick us out to the busses. It stands to reason that I could possibly spend 15 hours in the Magic Kingdom on my 50th. I might even blow off the afternoon swim back at the hotel. We'll see if I can make it. The Magic Kingdom makes me feel young and that's exactly what I want to do on my birthday so that's why I'm choosing to be there the entire day. I knew that I wanted to have breakfast at one of our all time favorite spots to kick off the day. 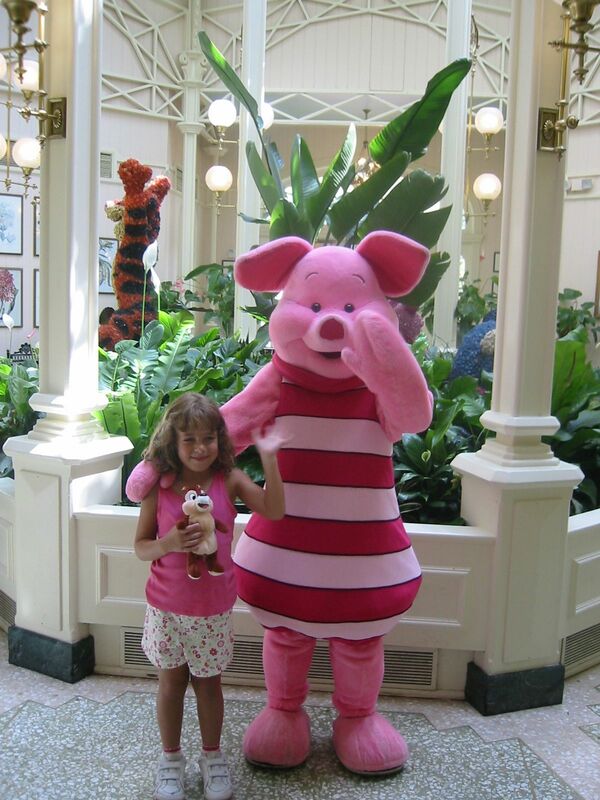 The Crystal Palace in the Magic Kingdom hosts a wonderful buffet breakfast with Winnie the Pooh and his friends. One of the older pictures that I could find of my daughter Samantha and Piglet at the Crystal Palace. Photo By Chris Barry. We never miss breakfast with Pooh on any of our trips, and this one will be no different. It's worth it for the breakfast lasagna alone. The buffet restaurants are a little easier when you're dealing with 23 people as well. I found that trying to book meals for that many people was doable, but a little difficult at times. Trying to organize that many people together with different tastes, different schedules, and different pocketbooks was a challenge. In the end, I made the reservation and offered the option up to everyone that might want to attend. Nobody turned down Pooh, so breakfast at The Crystal Palace for 23 to kick off my 50th it is! My parents offered to treat me to a good meal for my birthday and who am I to tun down such an offer? Considering that I wanted to be at or close to the Magic Kingdom all day, there were a few great choices. I could go all out and go for California Grill on top of The Contemporary Resort. We had one of the best meals of our lives up there on my wife's 40th. However, the best part about California Grill is being up there when they dim the lights for the fireworks and as you'll see, I had other plans for that. Citricos and Narcoosee's are both outstanding but I'm not such a big fan of being at The Grand Floridian. It's a little too sterile for me. I couldn't get into Be Our Guest of course, so it became obvious to me where I could go and still be nearby all the fun of Magic Kingdom—Artist Point at The Wilderness Lodge. 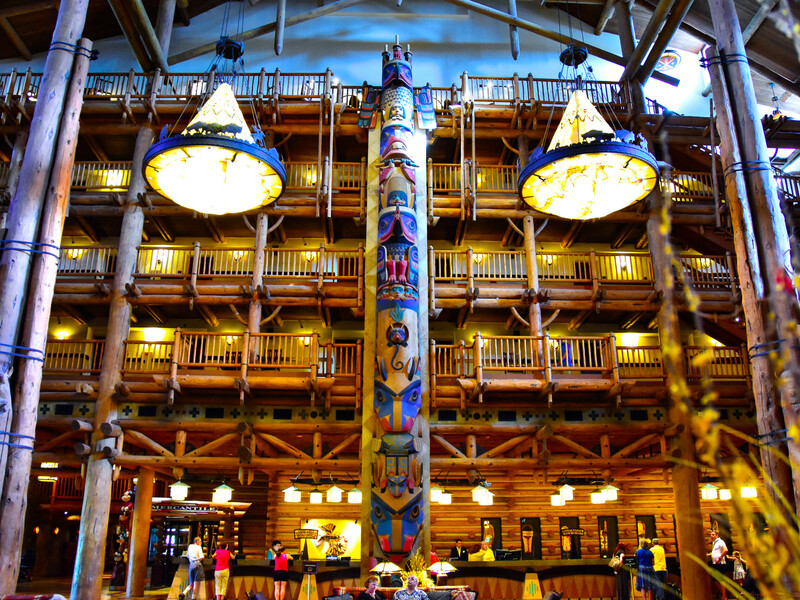 It's always a pleasure to just visit the lobby of Disney’s Wilderness Lodge. Photo by Donald Fink. Let's say this right off the bat, Artist Point is by no stretch of the imagination settling. It's one of, if not my top favorite restaurant on Disney property. We've had a few meals there before and it has always been excellent. The food is top notch, the wine list is extraordinary, and the staff is incredibly knowledgable. In addition, it's nestled in one of Disney's most striking hotel lobbies. The Wilderness Lodge is a beautiful resort, and I'm truly looking forward to the boat ride there and back for that little bit of extra special something. Bay Lake is what caught Walt's eye as he flew overhead searching for a location for his new Disney World, so taking a boat out into the lake to get to the Wilderness Lodge is a special treat for this Disney fan. Once again, I offered a link to the menu to everyone on the trip. I didn't want them to think that I was just booking one of Disney's most expensive restaurants and expected them all to come. I'm thrilled that they all replied yes. (Don't worry Mom and Dad... you're not treating everyone on the trip). If you're booking 23 people in a place like Artist Point, it's best to deal straight with the restaurant itself. That was the suggestion of the folks at Disney Dining when I called them to arrange a reservation, and the folks at Artist Point were wonderful to work with setting up this special dinner. I can't wait. The cedar plank salmon is divine. I'm well aware that aside from breakfast and dinner, I'm not going to be able to spend the whole day with all 23 people. We do have some FastPass reservations together, but inevitably we are going to split up and do our own things in the Magic Kingdom that day. Not everyone wants to do the same things at the same time, nor should they. That said I wanted all of these people to be with me during one of the most special moments of any day spent at Walt Disney World, the nightly fireworks at the Magic Kingdom. There's no better way to cap off a day spent at Disney than by watching the fireworks in front of Cinderella Castle. It's not just a bunch of fireworks in the sky, but also compelling music, projection, and narration that brings the Happily Ever After story to life. Photo by Bonnie Fink. The last time I was at Walt Disney World with my wife and kids and our Disney group of regulars, Wishes was the nighttime spectacular. We were all big fans of that amazing show. My wife and I had one of the most romantic and magical nights of our lives right there in the rose garden as we renewed our wedding vows right before Wishes began. Happily Ever After (the current fireworks show) isn't Wishes, but it's definitely a worthy successor. I'm the only one that has actually seen it out of everyone on the entire trip, so seeing it for the first time with my wife and kids is certainly going to be special. Seeing it with my Disney crew of dear friends is going to be just as special. 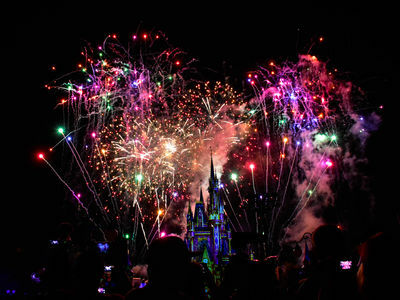 And seeing it with my family members and extended family members that are joining me, some of whom have never even been to Disney before and have no idea just how moving a Disney fireworks show can actually be is going to be just fantastic. I couldn't dream of a better way to cap off my big day than by watching Tinker Bell fly over all of our heads while beautiful music and breathtaking colors fill the sky, and the incredible special effects cascade all over the majestic castle. It's going to be a beautiful moment and something I hope to remember for a long, long time. I'll be there, on the bridge to Tomorrowland, right underneath Tink's flight path, experiencing one of the things I love most, in one of my most favorite places, surrounded by the people I love most in the world. I ask you again, what could be a better way to celebrate a milestone like my 50th birthday? At the end of the day, as we head back to The Yacht Club, drained and exhausted from a day spent at The Magic Kingdom, I'm sure my head will be full of memories and unique moments spent with all of these special people. How is 3-year-old Leslie going to react when he sees Pooh come to his table at breakfast? What are 19-year-old Syd and Julie going to think about their first visit to Disney? What is it going to be like to finally be in Walt Disney World with my brother for his very first visit? Will this be the trip that my boys go on Space Mountain with me for the first time? How often is my mom going to well up with tears? For that matter how often will I? What's it going to be like holding Diane's hand once again as Tinker Bell flies over our heads and how will my daughter Samantha react to that special moment in Happily Ever After that I know she's not expecting? These are the moments that are going to be occupying my thoughts as we head back to the hotel that night. However, what I'm looking forward to most that day will actually take place before and after we're in the park. Diane takes her morning run each day around the boardwalk and to the Studios and back and always stops at the BoardWalk Bakery for coffee, orange juice, and fresh Mickey muffins. Then we sit out on the balcony, eat breakfast together, plan out our day and watch the resort slowly come to life. Better yet, after we return home at night, we'll sit on those awesome rocking chairs on the veranda overlooking the pool, or maybe down on the beach alongside Crescent Lake if there's a bonfire going or we'll take a late night swim with the kids out at the quiet pool. Those are the Disney moments that I love best: the quiet ones. Those are the moments that people don't immediately associate with Walt Disney World. They don't think about quiet glasses of wine out on the balcony with good friends; walking slowly around the boardwalk at night watching the reflections from the lights flicker along the water as the friendship boats make their way back and forth across the lagoon; or watching your teenagers laying on blankets out on the Beach Club lawn watching classic Disney movies and eating popcorn. You'd swear they were 7-years-old again. Considering that it's one of the most visited places on the planet, Walt Disney World can be downright tranquil more often than anyone would imagine. It's those quiet, peaceful and magical moments that I'm looking forward to most with my loved ones. And it's those moments that crystallize my thought process and prove that there's no place else in the world I'd rather be as I turn 50 then with my friends and family at Walt Disney World this summer. Thanks for indulging me this time around with this more personal list. Click on the link below and let me hear your thoughts and I'll see you next time with another Disney Top 5. 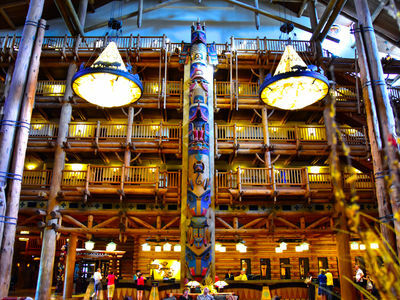 I love the Wilderness Lodge and we have had excellent dinners at Artist Point before. However, we have like you, had one of the best meals of our lives at the California Grill and if I was turning 50 again that would be hands down where I would have dinner if I wanted to stay close to the Magic Kingdom. The other option would be the Yachtsman Steakhouse. We were there in May and the service was incredible and the steaks were perfect. I understand not wanting to come all the way back to the resort from the MK but we would not hesitate to eat at the YS for any special occasion. We have been a little disappointed lately that we can't get any reservations at California Grill for our next trip in September. We will keep trying. Chris -- you are too young to worry about spending all day at MK. Four years ago, I celebrated my 70th at WDW - in a park from open to close. Due to some work responsibilities & the fact that my actual birthday was Mother's Day, we went home the day before. But we spent a week enjoying some Mickey magic. We ate great lobster at Fulton Crab House, before it closed and became Paddlefish, dined with chip & dale at Garden Grill. Why would anyone chose not to celebrate a birthday, retirement or any other occasion at WDW? Funny, I was just thinking about going to Disney for my 50th in February! Great timing! I would say I would likely add a trip to V&A's to my trip, but then again, I won't be going with 23 people! Turned 50 myself in May. Did a different trip than WDW for the day, itself, but will be visiting Mickey for a celebration some time this year. Enjoy! If I hadn�t moved down the street from Walt Disney World a few years ago l, I would probably have planned a similar trip here. Hope You get a chance to say hello. Happy Birthday Chris! I too spent my 50th at the Yacht Club. It was just DH and myself and they made a note about my 50th. Well, I was chosen resort family! And was upgraded to the concierge level!! Don't forget to get a birthday button and announce to everyone that you are 50. You can run into other birthday guests and have some extra WDW fun. Happy 50th, Chris!!! I've enjoyed many fine birthdays at the World, but the most memorable was when I turned 40, (mumble mumble) years ago. I had spent the previous 3 weeks learning to scuba dive, and my first official dive was in the Living Seas on my 40th, followed by dinner at the Coral Reef. So I got to enjoy the fish from both sides of the glass!